Obtain secret key from the old man in the Sandgem Town Pokemon Center. Summary: Pokemon Origin Platinum is a self-contained hack of Pokemon Platinum developed by Lazerith and inspired by the hacks by Drayano. Pokeradar pokemon have been unchanged everywhere except Trophy Garden, so use Serebii if you plan on using Pokeradar. Coronet anytime, Trophy Garden at Night Togepi — Egg given by Cynthia in Eterna, Trophy Garden Togetic — Evolve Togepi Natu — Solaceon Ruins Xatu — Evolve Natu Mareep — Valley Windworks Flaaffy — Route 222, Evolve Mareep Ampharos — Evolve Flaaffy Bellossom — Evolve Gloom Marill — Route 212 North, 215, Evolve Azurill Azumarill — Victory Road, Evolve Marill Sudowoodo — Route 214, 221 Politoed — Evolve Poliwhirl Hoppip — Route 205 South Skiploom — Evolve Hoppip Jumpluff — Evolve Skiploom Aipom — Route 204 North, Honey Trees Sunkern — Route 204 North Sunflora — Evolve Sunkern Yanma — Great Marsh Wooper — Great Marsh Quagsire — Route 212 South, Great Marsh, Evolve Wooper Espeon — Evolve Eevee Umbreon — Evolve Eevee Murkrow — Night at Eterna Forest, Anytime in Lost Tower Slowking — Evolve Slowpoke Misdreavus — Old Chateau, Night at Lost Tower Unown — Solaceon Ruins Wobbuffet — Lake Acuity, Lake Valor, Lake Verity, Evolve Wynaut Girafarig — Lake Valor Lakefront, Route 221 Pineco — Route 203, 210 South, Eterna Forest Forretress — Evolve Pineco Dunsparce — Ravaged Path, Oreburgh Gate Gligar — Route 206 Steelix — Iron Island, Victory Road, Evolve Onix Snubbull — Route 209 Granbull — Evolve Snubbull Qwilfish — Fish on Iron Island Scizor — Evolve Scyther Shuckle — Route 212 Heracross — Route 211 East, Honey Trees Sneasel — Route 216, 217, Lake Acuity, Lake Acuity Lakefront Teddiursa — Route 211 West, Lake Acuity Lakefront Ursaring — Route 216, 217, Lake Acuity Lakefront Slugma — Route 206 Magcargo — Evolve Slugma Swinub — Route 216, 217, Lake Acuity Lakefront Piloswine — Route 216, 217, Evolve Swinub Corsola — Surf at Iron Island, Route 220 Remoraid — Fish at Route 212, 213, 222, 223, Pastoria City, Sunyshore City Octillery — Evolve Remoraid Delibird — Route 216, 217, Lake Acuity Lakefront Mantine — Evolve Mantyke Skarmory — Iron Island, Fuego Ironworks Houndour — Route 214, Lake Valor Lakefront Kingdra — Evolve Seadra Phanpy — Route 207 Donphan — Evolve Phanpy Porygon2 — Evolve Porygon Stantler — Route 207, Lake Valor Lakefront Smeargle — Route 208, 212 North Tyrogue — Route 208, 211 West Hitmontop — Evolve Tyrogue Smoochum — Trophy Garden Pokeradar , Breed Jynx Elekid — Trophy Garden Pokeradar , Breed Electabuzz Magby — Trophy Garden Pokeradar , Breed Magmar Miltank — Route 210 South Blissey — Evolve Chansey Raikou — Route 228 Entei — Stark Mountain Outside Suicune — Surf on Route 225 Larvitar — Route 206 Pupitar — Evolve Larvitar Tyranitar — Evolve Pupitar Lugia — Surf on Route 230 Ho-oh — Stark Mountain Outside Celebi — Route 224 Treecko — Eterna Forest Grovyle — Evolve Treecko Sceptile — Evolve Grovyle Torchic — Route 211 West Combusken — Evolve Torchic Blaziken — Evolve Combusken Mudkip — Route 204 South Marshtomp — Evolve Mudkip Swampert — Evolve Marshtomp Poochyena — Route 214, Lake Valor Lakefront Mightyena — Evolve Poochyena Zigzagoon — Route 202, 213 Linoone — Evolve Zigzagoon Wurmple — Route 204 North, 205 North, Eterna Forest, Honey Trees Silcoon — Evolve Wurmple Beautifuly — Evolve Silcoon Cascoon — Evolve Wurmple Dustox — Evolve Cascoon Lotad — Route 203, 204 South, 205 North Lombre — Route 212 South, Evolve Lotad Ludicolo — Evolve Lombre Seedot — Route 203, 205 North Nuzleaf — Route 212 North, Evolve Seedot Shiftry — Evolve Nuzleaf Taillow — Route 207, 208 Swellow — Route 213, Evolve Taillow Wingull — Surf in various later routes and Cities. Huntail — Use DeepSeaTooth on Clamperl. This is the one change that I have made that I didn't include a document. No longer requires the regis pokemon to fight. In designing the new form, they paid attention to details; the designer redrew Giratina several times, attempting to make it look different from its form in Diamond and Pearl. Players wishing to make competitive teams using any fossil pokemon, spiritomb, or Pokemon that evolve via evolutionary items will now find that all fossils, odd keystone, and all evolution items are now sold in Veilstone Department Store. Players may have either one-on-one battles or two-on-two. Platinum 's play similarly to Diamond and Pearl 's; they feature three stages, awarding ribbons to Pokémon for having the best end result. Since you can buy generic items such as pokeballs and potions at any pokemart, the cashier that sells these items has been replaced with a selection of evolution items, and was not put into the department store anywhere else. 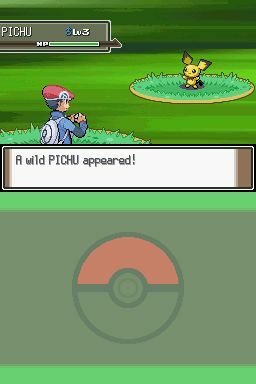 Similar to previous titles, players have their Pokémon fight turn-based battles against other Pokémon. Also for helping me make decisions throughout my time making this hack. It fell from the top 10 list in July 2009. 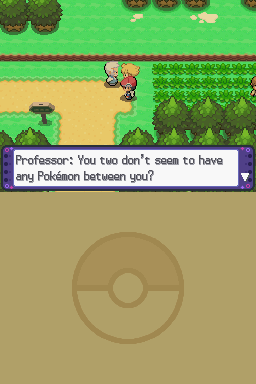 As of December 31, 2008, Pokémon Platinum had sold 2. For the week ended June 20, 2009, Pokémon Platinum fell off of the 's top 10 best-selling video games chart. In North America for the month of March 2009, Pokémon Platinum ranked second on the top 10 best-selling video games chart, selling in excess of 805,000 copies from March 22 to April 4. As of August 14, 2009, Pokémon Platinum had sold over 5. Spiritomb no longer requires going underground and meeting 32 people to catch. Credit given to MrCheeze for identifying script 201 as the cause. Alright, I tried out this hack. Coronet Machoke — Route 210 North, 211 East, Mt. Cresselia will drop Lunar Wing and will leave to roam Sinnoh Phione — Surf in Route 230. I think the patch is just broken. Coronet Loudred — Evolve Whismur Exploud — Evolve Loudred Makuhita — Ravaged Path, Oreburgh Gate, Oreburgh Mine, Wayward Cave Hariyama — Victory Road, Evolve Makuhita Azurill — Trophy Garden Nosepass — Mt. Event items such as Secret Key, Membership Pass, Oak's Letter, and Azure Flute are now given to you at certain parts of the game. Giratina now has Griseous orb held when you catch him. Coronet, Evolve Machop Machamp — Evolve Machoke Bellsprout — Route 205 After Eterna Forest , 207 Weepinbell — Route 210, Evolve Bellsprout Victreebel — Evolve Weepinbell Tentacool — Common Surf pokemon. With this Regigigas in party, go to route 228 to access the cave with Regirock Regice — After obtaining the national dex, catch Regigigas in Snowpoint Temple. 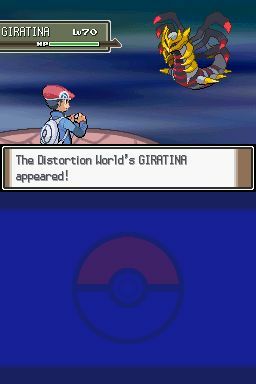 While it only had one form in Diamond and Pearl, it is given a new alternate form alongside a new area called the Distortion World, which features altered physics from the normal land of , where the game takes place. It was released on September 13, 2008, in Japan; March 22, 2009, in North America; May 14, 2009, in Australia and May 22, 2009, in Europe. Coronet Upper floors , Sendoff Spring Solrock — Lake Verity, Lake Acuity, Lake Valor, Mt. Bulbasaur — Eterna Forest Ivysaur — Evolve Bulbasaur Venusaur — Evolve Ivysaur Charmander — Route 211 west Charmeleon — Evolve Charmander Charizard — Evolve Charmeleon Squirtle — Route 204 south of cave Wartortle — Evolve Squirtle Blastoise — Evolve Wartortle Caterpie — Route 204 South, Eterna Forest Metapod — Evolve Caterpie Butterfree — Evolve Metapod Weedle — Route 204 South, Eterna Forest Kakuna — Evolve Weedle Beedrill — Evolve Kakuna Pidgey — Route 201, 202 Pidgeotto — Evolve Pidgey Pidgeot — Evolve Pidgeotto Rattata — Route 201, 205 Raticate — Evolve Rattata Spearow — Route 203, 207 Fearow — Evolve Spearow Ekans — Route 212 south Arbok — Great Marsh, Evolve Ekans Pikachu — Valley Windworks, Evolve Pichu Raichu — Evolve Pikachu Sandshrew — Wayward cave Sandslash — Evolve Sandshrew NidoranF — Route 201 Nidorina — Route 218, 221, Evolve Nidoran F Nidoqueen — Evolve Nidorina Nidoran M — Route 201 Nidorino — Route 218, 221, Evolve Nidoran M Nidoking — Evolve Nidorino Clefairy — Mt. During battle, the player may , use an item, switch the active Pokémon, or flee the last not an option in battles against trainers. Coronet to access the cave with Regice Registeel — After obtaining the national dex, catch Regigigas in Snowpoint Temple. 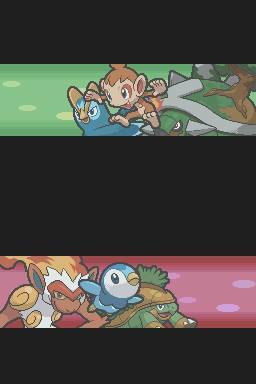 The trios of , , and , along with the trio of , , and , have been added to the game as well. Additions: Mewtwo 60 : Stark Mountain Interior — 1% chance of finding Mew 30 : Inside Turnback Cave — 1% chance of finding Entei 50 : Stark Mountain exterior — 1% chance of finding Suicune 50 : Route 225 — Surf 1% chance of finding Raikou 50 : Route 228 — 1% chance of finding Celebii 40 : Route 224 — 1% chance Lugia 55 : Route 230 — Surf 1% chance of finding Ho-oh 55 : Stark Mountain Exterior — 1% chance of finding Latias 50 : Route 230 Island — 1% chance of encounter Latios 50 : Route 226 — 1% chance of encounter Kyogre 60 : Route 226 — Surf 1% chance of finding Groudon 60 : Stark Mountain Interior — 1% chance of finding Rayquaza 70 : Top of Mt. I haven't experienced any post-game freezes, so please let me know if you find any, and I will fix them. With this Regigigas in party, go to Mt. It also crashed earlier when I entered the area, but I fixed that by swapping the game files. So don't fret if you accidentally use it. Coronet, Route 217 Electrike — Valley Windworks Manetric — Evolve Electrike Plusle — Valley Windworks Minun — Valley Windworks Volbeat — Route 214 Illumise — Route 214 Roselia — Route 208, 209, 212 North, 221, Evolve Budew Gulpin — Route 212 South Swalot — Evolve Gulpin Carvanha — Fish in Great Marsh, Iron Island, Route 213, 222 Sharpedo — Evolve Carvanha Wailmer — Surf Route 223 Wailord — Surf Route 223, Evolve Wailmer Numel — Route 206 Camerupt — Evolve Numel Torkoal — Route 206, Oreburgh Mine Spoink — Route 214, Ravaged Path, Oreburgh Gate Grumpig — Evolve Spoink Spinda — Route 211 East, Ravaged Path Trapinch — Ruin Maniac Cave Vibrava — Evolve Trapinch Flygon — Evolve Vibrava Cacnea — Route 211 West Cacturne — Evolve Cacnea Swablu — Route 210 North Altaria — Evolve Swablu Zangoose — Route 208 Seviper — Route 208 Lunatone — Lake Verity, Lake Acuity, Lake Valor, Mt. Kingler — Evolve Krabby Voltorb — Fuego Ironworks Electrode — Evolve Voltorb Exeggcute — Great Marsh Exeggutor — Evolve Exeggcute Cubone — Night at Route 203, 208, anytime in Lost Tower Marowak — Victory Road, Evolve Cubone Hitmonlee — Evolve Tyrogue Hitmonchan — Evolve Tyrogue Lickitung — Route 215 Koffing — Oreburgh Mine, Route 212 South Weezing — Evolve Koffing Rhyhorn — Route 214, Victory Road Rhydon — Victory Road, Evolve Rhyhorn Chansey — Route 209, 215, Evolve Happiny Tangela — Route 210 South, Great Marsh Kangaskhan — Great Marsh Horsea — Fish in Route 220, 223 Seadra — Evolve Horsea Goldeen — Fish in various places. Golem — Graveler evolves into Golem at level 36. Coronet, Evolve Bronzor Bonsly — Trophy Garden, Breed Sudowoodo Mime Jr. I just hope that the game can either be fixed, or I might be able to be told how to skip this area and move onto the other parts of the game, Ie: survival area, resort area, routes inbetween, etc. This leads me to believe that the Azure Flute, Oak's Letter, and Membership Pass all will fail, however I can't prove this. Evolve Tentacool Geodude — Caves Graveler — Found in a few caves and routes. Coronet Jirachi — Route 224 Deoxys — Stark Mountain First Floor Turtwig — Starter, Eterna Forest Grotle — Evolve Turtwig Torterra — Evolve Grotle Chimchar — Starter, Route 211 West Monferno — Evolve Chimchar Infernape — Evolve Monferno Piplup — Starter, Route 204 South Prinplup — Evolve Piplup Empoleon — Evolve Prinplup Starly — Route 201, 202, 203, 204, Lake Verity Staravia — Route 209, 210, 212 North, 215, Lake Valor, Valor Lakefront, Sendoff Spring, Evolve Starly Staraptor — Evolve Staravia Bidoof — Route 201, 202, 203, 204 North, 205, Lake Verity Bibarel — Route 208, 209, Lake Valor, Valor Lakefront, Lake Acuity, Sendoff Spring, Evolve Bidoof Kricketot — Route 201, 202, 203, 204 North, 205 North, 207 Kricketune — Route 206, Lake Valor Lakefront, Evolve Kricketot Shinx — Route 202, 203, 204, Valley Windworks Luxio — Route 222, Fuego Ironworks, Evolve Shinx Luxray — Evolve Luxio Budew — Route 204, 205 North, 208 Roserade — Evolve Roselia Cranidos — Restore Skull Fossil Fossils can be bought in Veilstone Department Store Rampardos — Evolve Cranidos Shieldon — Restore Shield Fossil Fossils can be bought in Veilstone Department Store Bastiodon — Evolve Shieldon Burmy — Honey Trees Wormadam — Evolve Burmy Mothim — Evolve Burmy Combee — Honey Trees Vespiquen — Evolve Combee Pachirisu — Route 205 South, Valley Windworks Buizel — Route 205 South, 213, Valley Windworks Floatzel — Route 218, 221, 222, Fuego Ironworks, Victory Road, Evolve Buizel Cherubi — Honey Trees Cherrim — Evolve Cherubi Shellos —Various Areas.